The Commodore 128D, introduced in Europe over two years ago, has finally made its way to the U.S., replacing the 128 as Commodore's premier eight-bit machine. The new 128D is everything an upgrade should be. It's an enhancement of the 128 that's completely compatible with all existing software and peripherals. The most obvious change in the 128D is its new exterior, which strongly resembles Commodore's Amiga 1000. Features include a detachable keyboard and a sleek metal case that houses the system hardware, the power supply, and an upgraded 1571 drive. Not only is the 128D's new look more polished and professional than the 128's, the new design has some practical advantages, too. The 128D's detachable keyboard uses the same layout as the 128's, but has a lighter action, making lightning fast touch typing easy. The keyboard's cord is shorter than it should be, but it's long enough to let you reap most of the benefits of detachability. The slim metal case that houses the system hardware protects the computer's delicate circuitry from coffee spills and also acts as an excellent RF shield. Like the Amiga 1000, the system unit can be used as a convenient monitor stand, with a 128D ensemble taking up much less desk space than a 128 system with an external disk drive and monitor. Commodore did more than just wrap the 128 in an attractive new package. There are several internal improvements worth noting, the biggest being a dramatic increase in 80-column video RAM. The 128's 8563 chip had 16K of dedicated RAM, but the 128D has a massive 64K. This new RAM makes exciting multicolor, hi-res 640 X 200 graphics possible on the 128D. There are more hardware improvements to the 1571. Recently, Commodore updated its stand-alone 1571 disk drive by releasing new ROMs, which corrected some bugs in previous editions and increased the drive's speed. The new 128D's internal 1571 sports these upgraded ROMs. The CP/M 3.0 operating system that comes bundled with the 128D is also enhanced. It now fully supports Commodore's new 1581 3½-inch disk drive and includes several utilities not found in the initial releases of the 128's CP/M. As far as the user is concerned, the 128D functions just like the 128. It has three modcs: 64 mode (with 40-column composite color video and BASIC 2.0), 128 mode (with 40-column composite color video, 80-column color RGB video, and BASIC 7.0), and CP/M mode (using the 128's inboard Z80A microprocessor). And it runs both GEOS and GEOS128 operating systems. All the familiar input/output ports on the old 128 are represented on the 128D, but some are in different locations. They include two ports for joysticks or a mouse, a serial port for disk drives and printers, a port for a RAM expansion module, a cassette port, and a user port for a modem or RS-232 interface. Just like the 128, the 128D boasts a handy reset switch. The 128D appears to be completely compatible with the 128. We've tested it with a wide range of software and peripherals in 64 mode and 128 mode, with CP/M, and with GEOS and GEOS128. All software and hardware performed without problems. There isn't much to criticize about the 128D. If fact, my only reservations center around the internal 1571 drive. Although an internal drive can have many benefits, it also has some drawbacks. First, there's the matter of repair. If the drive needs to go to the shop, the whole system must go. Also, the 128D's internal 1571 doesn't have the external DIP switches that make reassigning device numbers so easy on the standalone versions. 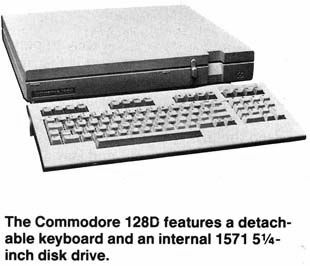 Commodore must assume that you'll always want the internal drive to be configured as device 8, but users with a 128D and a 1581 drive may not see things that way. The last problem with the internal 1571 is that it makes the 128D more expensive than a 128. With the latter machine, a 64 owner could upgrade to a 128 and use his or her 1541 disk drive. With the 128D, the drive comes with the system, so you don't have any choice about purchasing it. But these are minor points. The 128D is a winner. It's well designed, compatible with the 128, and has some important enhancements.